Rush Hour 3: Abbot and Costello meet the Triads | Phil-zine! I’m weeks behind in my movie watching and I feel left out as I haven’t seen “The Simpsons Movie” nor “The Bourne Ultimatum”. 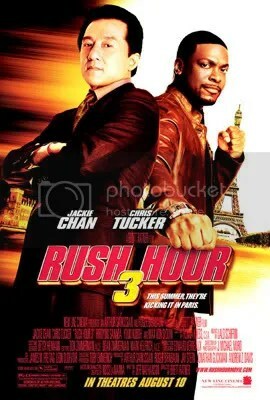 Strangely I did get a chance to see a midnight showing of the third installment of the Rush Hour series, creatively titled “Rush Hour 3”. But how much more creative can a series like this get? Surprisingly enough, the movie itself knows not to get too creative, instead it takes a completely alternate path; it strips itself of any level of realism and drama that the first two held onto, and instead latches onto the equation that many of the old Abbot and Costello movies lived by: paper thin plot with some entertaining bits thrown around. In this installment Detective James Carter (Chris Tucker) and Chief Inspector Lee (Jackie Chan) go up against the underground organization of the Triads. That’s really all you need to know. When I say paper thin, the movie doesn’t make any apologies about a character randomly showing up in a hotel room, that would be the ever-ready Max von Sydow playing his tried and true bad guy self, to reveal some information about what the character should do next, then walking out once the information has been given. The movie dares you to laugh at it’s wink-wink plotting. I can almost hear Brett Ratner (Rush 1 and 2, Red Dragon and some other hack jobs) and Jeff Nathanson (the writer of “Catch Me if You Can”, “The Terminal”, the hilariously overlooked “The Last Shot” and the forthcoming “Indie 4”) giggling at the typewriter. Nathanson doesn’t lose his sharp wit here and manages to throw in some great lines. And Ratner surprisingly choreographs some really fun sequences, one involving a car chase…honestly with Tarantino and Ratner car chases might be in again. And that’s the fun of the movie, it knows it doesn’t have a plot to hold onto, just the charisma of the actors and that includes a colorful supporting cast. So, I guess it really boils down to, do you like Chris Tucker and Jackie Chan or not? I’ve always loved Jackie Chan, it seems he does better in movies with less plot anyway. Personally, I found Chris Tucker to be on his game most of the time. The film makers sometimes don’t know when to cut away from him, or when not to cut back to him, or when to cut away from a scene. It’s almost like they always want that extra one-liner. They want you wondering what will that crazy guy say next. He has some really great moments though, including his first scene working as a traffic cop and later when they are trying to rescue the damsel in distress, who is more than she appears to be, he shares an absolutely hilarious and over the top scene with Jackie when they’re caught on stage and have to sing their way off. The movie itself is almost worth seeing for this moment alone. For all the joys it takes from copying the A&C movies of the past, it also suffers from some of the pitfalls of the later films. Like, not much of a plot. So the movie itself kind of slips away from you after a few hours. But it’s enjoyable while it’s there. Jackie Chan, while still sprightly, looks like he’s getting creaky, and how could he not after all of the abuse he’s taken over the years. In the outtakes, he continues to take it as well. It was sad to see him in an obvious special effects sequence, which I won’t point out, just in case none of you notice. But he does pull off some pretty impressive fighting sequences throughout, and I love him for continuing to throw himself into harms way. In the end Tucker and Chan dance off down the street together, brothers again, and in the back of my head I almost hoped that they would make a fourth film…maybe next time they can go up against Bigfoot! This entry was posted on August 13, 2007 at 8:12 am and is filed under Current Movies and Reviews. You can follow any responses to this entry through the RSS 2.0 feed. You can leave a response, or trackback from your own site.